If, after having read “Acoustic or Digital: What’s Best for Me?,” you’ve decided on a digital piano, the next step is to shop for and select the right model for your needs. There are currently some 200 models of digital piano on the market. Narrowing the field requires exploring some basic issues. Grand: If the piano will be in elegant surroundings, you may choose a grand-style digital. Digital grands come in lengths of about three feet—just long enough to suggest the shape of a baby grand—to about five feet. Like some of the console models, these are often available in a variety of wood-grain finishes and the polished ebony finish common in today’s acoustic grands. You will usually pay a premium for the elegant furniture. Grands start at $1,500, with most priced between $3,000 and $10,000, and a few as high as $20,000. Note that there is little or no relationship between an instrument’s physical style and its musical features—slabs are often used on stage by professional musicians, and grand-shaped digitals may have features no better than the non-grand versions they’re based on. However, the larger spaces enclosed by a grand-piano cabinet and some console cabinets can accommodate more, larger, and more advantageously positioned speakers, particularly bass speakers (woofers). This, and the sympathetic vibration of a wood cabinet, may result in better sound quality from the onboard speakers of some cabinet models than that found in digitals without cabinets, especially slabs. If multiple players will use the instrument, it needs to meet the expectations of the most advanced player. At the same time, a beginner in the family will benefit from features that are of no interest to the advanced player, and still another family member may just want to fool around with the instrument once in a while. Easy-play features and educational software will keep these players happy—and you might be surprised how many people are enticed into learning to play as a result of these easy first steps. So, obviously, an individual player may search among a very narrow range of instruments, while a family may have to balance the different needs of several people. Fortunately, the wealth of available choices can easily accommodate any combination of individual and/or family needs. Other, slightly more expensive models, called ensemble or arranger digital pianos, generally have all the features of standard digitals, but also come with two other major features: Easy-Play and Auto-Accompaniment. With Easy-Play, playing as little as a single key will trigger the sound of an entire chord. With Auto-Accompaniment, an entire musical combo or orchestra (strings, horns, percussion, etc.) will back you up as you play, and automatically change its accompaniment to match your melody or changing chords. These backing tracks, known as styles, come in all kinds of musical forms, such as Swing, Latin, Rock, World, and so forth—with many different rhythms and special effects. The best of these styles are of a caliber that will please the most discerning ear. Some kinds of music, especially classical, require a level of musical expression that traditional acoustic pianos have evolved to satisfy. For those who play, or plan to play, this music, the ability of a digital piano to imitate the sound, touch, and pedaling of an acoustic piano is important. For players of other kinds of music, however, the ability of a digital piano to sound or play like an acoustic one may be less important. Although virtually all digital pianos are designed to imitate acoustic pianos to some extent—that’s why they’re called digital pianos, not electronic keyboards—they vary considerably in how accurately and thoroughly they do so. Re-creating the piano’s acoustical resonance, and the sympathetic vibrations of the strings of an acoustic piano’s unplayed notes—that is, the keys the player hasn’t struck—especially when the sustain pedal is depressed, as well as the sound of a vibrating string being silenced by a damper when a key is released: sounds that are subconsciously part of the acoustic-piano experience. Note that all of the models that we consider to be digital pianos have 88 notes, the keys are weighted, and, in virtually all of them, the touchweights are graded (i.e., the resistance to your touch gradually decreases from bass to treble) across the range of the keyboard—all just as in an acoustic piano. Instruments with fewer than 88 notes, or with semi-weighted keyboards that depend on springs for their weight, should be avoided by those looking for a realistic acoustic-piano experience. Digital pianos communicate with a computer and each other via a music-technology language called Musical Instrument Digital Interface (MIDI). MIDI is not music—it’s a stream of data commands that basically specify which notes are played, when, and how loudly, among other parameters. This common language allows music composed on one digital piano to sound more or less the same when played on another (“more or less” because, even when both instruments are playing their respective “piano” voice, for example, the tonal characteristics of the two “pianos” might be quite different from one another). MIDI also allows your digital piano to interact with music software on your computer. As mentioned earlier, digital pianos create and record music as a sequence of MIDI commands—thus the name MIDI sequencer for the most common form of internal recorder in a digital piano. This type of recording system is popular because it requires relatively little memory, and because of its simplicity and flexibility: If you later want to play the music back with different instrumental sounds, all you need do is specify the different voices, usually by pressing a button or two—you don’t have to re-record the music. In this tutorial, we’ve only barely scratched the surface of the amazing features of today’s digital pianos. 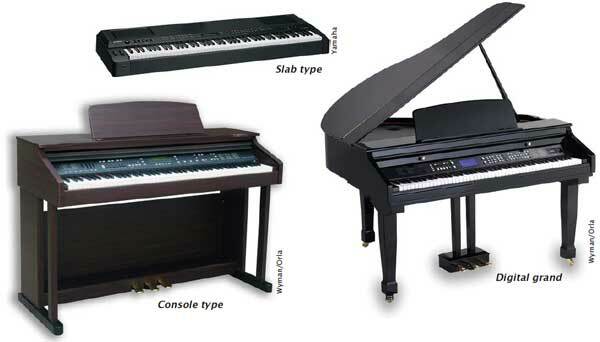 You can read about these and other features in greater depth in our online-only “Digital Piano Basics” articles. Read on for information and tips about the process of shopping for a digital piano. Calibrate your ears. Before you shop, “calibrate” your ears by listening to recordings of solo piano. Listen to whatever type of music you enjoy—and use the headphones you bought for your digital piano. 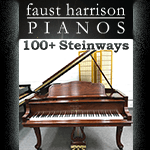 This will embed in your mind, as a benchmark, the sound of high-quality acoustic pianos. Evaluate the touch. Aside from sound, the most important element in the selection of an instrument is likely to be the feel of the action. You’ll be selecting from a variety of actions that all try to emulate the feel of an acoustic piano—some lighter, some heavier. Just as there is no single correct piano sound, there is no single correct touch; rather, there is a range of acceptable touches. If you spend most of your playing time with a heavy action, then when you encounter an instrument with a lighter action, you’ll play too heavily—and vice versa. The cure is to play as many instruments as possible, as often as possible. Listen to how each piano responds and adjust your touch accordingly. With experience, you’ll learn to adapt. Used digitals. Because digital-piano technology advances at a blistering pace relative to acoustic-piano technology, there is much less interest in used digitals than in used acoustics. Many of today’s digital pianos eclipse the capabilities of the models of even five years ago. Combine this technological advancement with the fact that support of older instruments may be limited—electronics manufacturers are required to maintain replacement parts for only seven years after production ceases—and investing in older models becomes worthy of serious second thoughts. This article is adapted from several articles on buying a digital piano in Acoustic & Digital Piano Buyer. 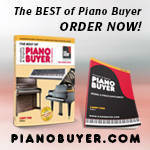 The full articles are available free of charge at www.PianoBuyer.com. Acoustic & Digital Piano Buyer is a semiannual publication concerning new, used, and restored acoustic pianos and digital pianos. The publication is a hybrid book and magazine. The “book” part consists of a series of tutorial articles, illustrated and in color, each covering a different aspect of the piano-buying experience. These articles will not change, or will change very little, from issue to issue. The “magazine” part consists of articles of more temporary interest, and reference material (current prices, specifications, etc. ), that will change over time. Piano Buyer is available both as a free electronic publication and in a print version that can be purchased online or in bookstores. See www.PianoBuyer.com for more information.